(CNET) -- U.S. Homeland Security Secretary Janet Napolitano announced Wednesday she is putting a Microsoft executive in charge of protecting the U.S. government's computing systems. U.S. 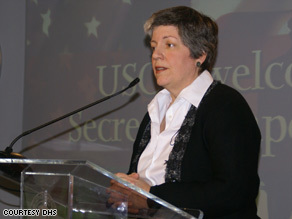 Homeland Security Secretary Janet Napolitano named a Microsoft exec to head the nation's cybersecurity efforts. Napolitano has appointed Philip Reitinger to be deputy undersecretary for the department's National Protection and Programs Directorate, where he will be responsible for protecting federal computing systems from domestic and foreign threats. Reitinger currently serves as Chief Trustworthy Infrastructure Strategist at Microsoft. "Phil's background in cybersecurity and computer crime coupled with his experience working across the federal government and the private sector to develop innovative security strategies makes him an asset to our department," Napolitano said in a statement. In his role at Microsoft, where he is responsible for protecting information technology infrastructure, Reitinger has worked closely with government agencies and other private partners on cybersecurity protection programs. Reitinger also has experience in the public sector. He formerly served as the executive director of the Defense Department's Cyber Crime Center, which provides electronic forensic services and supports cyber-investigations. Before that, he was deputy chief of the Computer Crime and Intellectual Property division at the Justice Department. Reitinger also sits on the Federal Emergency Management Agency National Advisory Council, which advises the FEMA administrator on cybersecurity. Reitinger's appointment comes a week after Rod Beckstrom, director of the DHS National Cybersecurity Center, resigned because of what he perceives as attempts by the National Security Agency to control DHS cyber efforts. The National Cybersecurity Center falls under the jurisdiction of the National Protection and Programs Directorate, so Reitinger will be responsible for replacing Beckstrom, according to DHS spokesperson Amy Kudwa. Another Microsoft executive with government experience, Microsoft Vice President Scott Charney, repeated Beckstrom's concerns on Tuesday, telling Congress that the cybersecurity mission does not belong in the hands of the NSA. "It's really important to empower DHS to take the necessary operational role," he said.